The Dark Knight Rises is now available in most major stores – released today on DVD and Blu-Ray. Amazon and Wal-Mart have the DVD listed at $12.96 and the Blu-Ray at $17.96. Best Buy has the DVD at $14.99 and Blu-Ray at $18.99. Along with the release of The Dark Knight Rises, there are also combo packs available with exclusive content added. 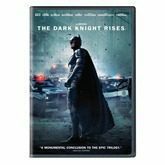 There are several Dark Knight Trilogy packs available as well, priced from $19.96 on DVD and $27.96 on Blu-Ray at Amazon to $34.99 at Best Buy for the Blu-Ray with exclusive content included. The Dark Knight Rises story picks up eight years after The Dark Knight. Batman has disappeared after being blamed for the death of Harvey Dent. It isn’t until a band of terrorists led by the masked Bane threaten everyone in Gotham City that Batman comes out of his self-imposed exile. The movie will reveal if Batman still has what it takes to fight the ruthless Bane. With the release of The Dark Knight Rises on DVD and Blu-Ray, this completes the trilogy for director Christopher Nolan. How do you feel about this being the end of the trilogy? Let us know in the comments below!